We suffered a tough loss on our Sharks Best Bet last night as San Jose blew a pair of 2-goal leads, one of them in the third period, to fall 5-4 at home to the Wild. Our leans went 3-3 with a couple Unders losing on late goals and the Kings laying a total egg against the Red Wings. Six games in the NHL tonight, most of them later starts for those of us living along the east coast in North America – and definitely for our readers in Europe. Hopefully you’re able to stay up late on a Friday night to catch some of the action. Good luck, and we’ll be back tomorrow for the 12-game card. Two “hot” teams here but we’re putting a lot more stock in Calgary’s play lately (4-1 last 5, 4-1 last 4 on the road) than Vancouver’s (5 straight wins). The Flames have been controlling games recently. Part of that has been weaker opposition, but they’ve still scored 4 goals or more in 4 of their last 5 games and 5 of 7. Besides, it’s not always easy to elevate your game against weaker opponents, but the Flames have done a good job in not letting down. Dating back to the start of December, Calgary has won 10 of 14, with 7 of those wins coming by 2 goals or more. Vancouver’s winning streak doesn’t have the same feel. 4 of the 5 wins were by 1 goal, and it has come on the heels of a stretch in which Vancouver had 2 wins in 8 games. This looks similar to the start of the year, when the Canucks scored a lot of goals late in regulation and then won a few OT games to get off to a hot start before they went into the tank for a month. Calgary’s scored 3+ goals in 7 of its last 10 and allowed a total of 10 goals in its last 5 games. Vancouver’s allowed 7 goals in 5 games, but they’ve scored just 12 regulation time goals in their last 7 outings. If one team is going to win this game comfortably, it’ll most likely be Calgary, and that’s who we’ll roll with tonight as short road favourites. 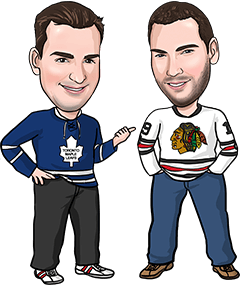 Reasons to bet Toronto: The Leafs have won 5 of their last 6 games and have earned points in 9 of 10 games. New Jersey has been held to 2 goals or less in 7 of its last 10. Reasons to bet New Jersey: The Devils have won 2 straight and 3 of their last 4. Toronto has lost its last 5 trips to New Jersey, including once already this year. Reasons to bet Nashville: The Predators seem to have solved their road issues, winning their last 4 games away from home by a combined score of 17-3. Florida has lost 5 straight at home. Reasons to bet Florida: The Panthers are well-rested, having played just once this month while Nashville is playing for the second straight night and 3rd in 4. Reasons to bet Carolina: The Hurricanes won 4-2 last night in St. Louis to improve to 6-3-1 in their last 10 games. Chicago needed a late goal in regulation time last night and then another in OT to avoid losing for the 6th time in 7 games. Reasons to bet Chicago: That comeback win over Buffalo could spark the Blackhawks, who are one of the league’s streakiest teams. Carolina has just 6 wins in 22 road games (6-10-6) and has lost 4 of 5 in Chicago. Reasons to bet New York: The Islanders have won 4 of their last 5 games and scored 4 goals or more in each of those games. Colorado has lost 10 straight games at home and 10 of 11 overall. Reasons to bet Colorado: New York is just 4-8-2 on the road and hasn’t played since last Saturday. Reasons to bet Arizona: The Coyotes have to hope that Anaheim overlooks them a bit, especially with a home game against Minnesota on deck Sunday. The Ducks are expected to be without Getzlaf. Reasons to bet Anaheim: The Ducks are 6-0-1 in their last 7 home games and are 12-4-2 at home overall this year. Arizona has lost 8 straight games, with 6 of those losses coming by 2+ goals.